There are already a few extensions out there. The Gmail one works great, but I could use a little sound alert with it. Google Calendar users, you go here. And there’s an AccuWeather one, a pop-up Google News headline thing, and several more. The Ad-Block one, though, didn’t block anything on my Dev Channel release of Chrome, and instead of an icon top-right, you get a blank space where an icon should be. The real roll out starts this week, probably Wednesday. Look for a gallery similiar to what they’ve done for Chrome Themes. » How much do I love Chrome extensions? 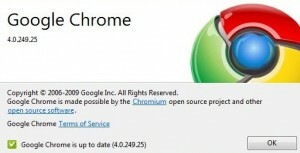 » Another indication of Chrome extensions?